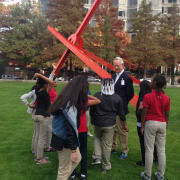 Each docent is required to lead two one-hour tours per week, Tuesday-Friday, throughout the school year, between 10:00 a.m. and 2:00 p.m. Docents have the option to continue touring in the summer. All docents attend regularly scheduled Monday training sessions September-May to continue learning about the Museum’s collection, exhibitions, and best practices in museum education. Interested applicants must submit an application for the New Docent class by June 8, 2019. The application can be found here: https://dallasmuseumofart.wufoo.com/forms/rilqaxs145nvrc/. In-person interviews will be conducted in June 2019. All new docents will be required to undergo a background check through Verified Volunteers.